Did you know that 7 in 10 girls believe that they are not good enough or don’t measure up in some way, including their looks, performance in school and relationships with friends and family members. Many girls lack the skills and abilities needed to self-improve so they can develop that certainty and confidence that is required for success and overcoming obstacles in life. Making choices, communicating and having self-confidence to make things happen doesn’t always come easily. At FITGIRL we want to help increase a young girl’s awareness in identifying who they are and what they want. During the 5 day camp, we help develop their abilities so they can grow confidently by equipping them with life skills so they can succeed. They will learn how to handle difficult situations and people, as well as overcome barriers to achieve goals. Most importantly, we will teach them about the importance of choosing healthy foods that fuel their body and get them excited to exercise and stay active. FITGIRL focuses on what is already inside your daughter – she just needs to learn how to tap into her own skills and abilities to shine. Exercise techniques are taught in a fun way so that your daughter wants to exercise and views it as a good thing, not something she dreads. We all know how difficult it is to stick with an exercise program that we don’t enjoy. When kids find out that exercise can be a lot of fun, they naturally want to do it and stick with it! All meals and drinks will be provided. 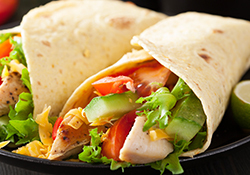 Lunches will be planned by a licensed nutritionist/dietician and prepared by a local chef. Hy-Vee will also be providing meals and providing information on the importance of proper nutrition. Girls will learn how to prepare their own healthy, fulfilling lunches and understand the importance of eating a balanced meal. Please indicate medical conditions and food allergies on the registration form. Girls will be introduced to yoga, kayaking and group fitness classes. Each day they will have an opportunity to learn self esteem and goal setting skills from local Olympic Hopeful, Aubrey Baxter and inner and outer beauty tips. Many girls with low self esteem have a hard time making friends or getting involved in sports and group activities. 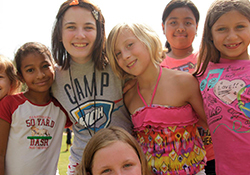 FITGIRL will provide opportunities for the girls to build new relationships through role playing and team building activities that help them feel more confident with a deeper self awareness of who they are and why they are special in their own unique way. Girls ages 10-14 on or before July 19, 2015. The 5 day camp costs $169 and includes a FITGIRL T-shirt and FITBag of personal goodies! Camp will be held at Lake Zorinsky – 156th street entrance. Drop off’s will be located by the dock and classes will start at 9am and end promptly at 1pm. If we run into inclement weather, we will reschedule later in the day or chose another day the following week as a makeup day. Parents will receive an email if class is cancelled due to weather. Things that beep, click, flash, ring, vibrate and are of an electronic nature that distract the girls are not needed at the camp. Please make sure the girls leave these at home or that you collect them prior to check-in. Believe us when we say… they won’t even have a minute to use these crazy electronic devices any way! Aubrey has been involved with Complete Transformation Magazine’s, Seeking Self Love Tour that visits local schools speaking with teenage girls about bullying, body image and self-esteem. During the five day FITGIRL camp, Aubrey will provide opportunities for the girls to grow and develop skills needed to become confident, respectable and active. Her course focuses on inner dialogue, self esteem, communication and friendships. 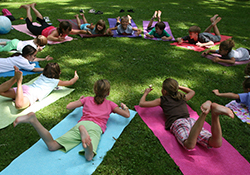 Lora will instruct the yoga and meditation classes and provide the girls with an understanding of Mindful living. The buzz word Mindful Living is defined several ways. From Lora’s experience of practice, it has opened the door to presence. Time has expanded. Daily, LOVE lives louder. Fear, anxiety and depression lessen. The reason is simple. In the present moment we remember that only love is real. Future story telling and anxiety ceases. Past story telling and depression quiets. Even if it is for just a single Mindful Moment, the breath is found. Those moments build and soon you realize that you are living a MINDFUL LIFE. Jeannie will teach each FITGIRL the principles of eating and cooking healthy, juicing, and empower her to make better choices by choosing the right snacks and use nutrition to help correct some of the side effects of various health issues kids experience today. All meals will be prepared in advance by Jeanne and she will explain the benefits of each food item as well as how certain foods help provide more energy, improve skin, enhance performance and prevent illness. Amie will be discussing with the FITGIRL camp personal branding: Exploring and learning the importance of finding, and building, your own personal brand and how to confidently share it with the world. How Media and Marketing can influence choices girls make and will also discuss the posting of selfies and when is it ok to jump into social media like Twitter, Snapchat and Instagram. Click here to learn more about Smart Girl Style. TIGER ROCK ACADEMY: Tiger-Rock will be showing the girls how to identify potential danger, act with confident independence to get to safety, and if necessary know how to physically protect themselves. WOGG WORKS: Walt and Chris Vosicka, WOGG Works owners, will teach girls proper paddling techniques while they experience the serenity and peace water can provide leaving them with a greater appreciation and respect for nature. Both Chris and Walt are certified as ACA kayak instructors and with the Red Cross in CPR and First Aid. Safety is paramount at WoggWorks and life jackets are mandatory. MOXIE SALON: Tara, owner of Moxie Salon, and her team want to help each girl feel beautiful in their own skin and will teach each girl quick day hair styles, proper hair hygiene, how to get beauty waves and using a flat iron without ruining their hair. SAMANTHA BARTELS: Samantha, licensed esthetician specializing in skin care and make-up, will show and discuss how to naturally take good care of skin, how to apply make up that enhances their features and discuss how much is too much when applying makeup at a young age. MICHELLE HOMME: Michelle, founder of The G.I.F.T.™, a 75 member women’s empowerment group, will help the girls stop comparing themselves to one another. Girls (and women) need to be reminded of their own great qualities and natural beauty, stop comparing themselves to their peers, and stop looking for what they are lacking instead of what they possess. She will help the girls stop being afraid of who they really are and be confident in all that they can be. More information on Michelle’s programs can be found at www.constantchangetoday.com. KELLY ADAIR: Passion is the one word she uses to describe how she feels about helping other people discover the benefits of exercise, healthy eating, and cultivating inner strength. Kelly profoundly understands the immense amount of courage it takes for someone to take the first step. She wants to help FITGIRL’s find their courage and confidence to do whatever their heart desires and ignore the naysayers and non-believers. Her attitude is NEVER SURRENDER. Kelly is excited to be part of Omaha’s first Orangetheory Fitness studio and is ready to paint the town Orange! Orange Theory is proudly sponsoring Kelly’s message at the FITGIRL camp in July. ANNA PETERS: Growing up Korean-American, Anna struggled with identity and always felt she was different than her friends and peers. Anna will talk to the girls about embracing their true identity, being proud of who they are and where they came from and empower them to reach out to other girls who are of a different race, origin and nationality and let them know they are amazing and loved regardless of how they look, talk and live. 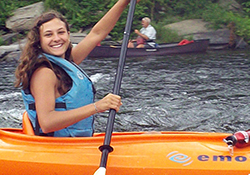 *KAYAKING FRIDAY ONLY* – all day (wear swimsuit under clothes and bring sunscreen) Lifejackets provided. Cheri Dickmeyer: cheri@ctmomaha.com or call 402-522-6330. New Website Coming Soon!